The project has been plagued by a number of electrical issues of late. The main problem is that the elevation axis of the motor drive that positions the dish has been unable point. We’d initially put this down to improper torque being applied to the counterweight. However, the curious part about this is that the dish had moved under its own power before, with equivalent counterweighting applied. Our attention then immediately turned to the electronics driving it. As we have discussed before, we have suffered a number of issues with control unit which have considerably set us back, but it is now back in correctly working condition. So we can fairly safely rule that out. The only thing remaining, which we have previously suspected, is the continuity on the wires that send the power and control pulses between the control room and the telescope. To give our existing cables a fighting chance, a crack team of our members set to work to tear the wiring apart and resolder everything from scratch. After toiling for hours over this task, the team found that the wiring had indeed suffered some corrosion, which was preventing the correct amount of power from driving the motor. Although it may seem like a waste of time, we at least know that the expensive electronics are not to blame and the problem should be remedied by installing a new run of cable, which is a relatively easy job. 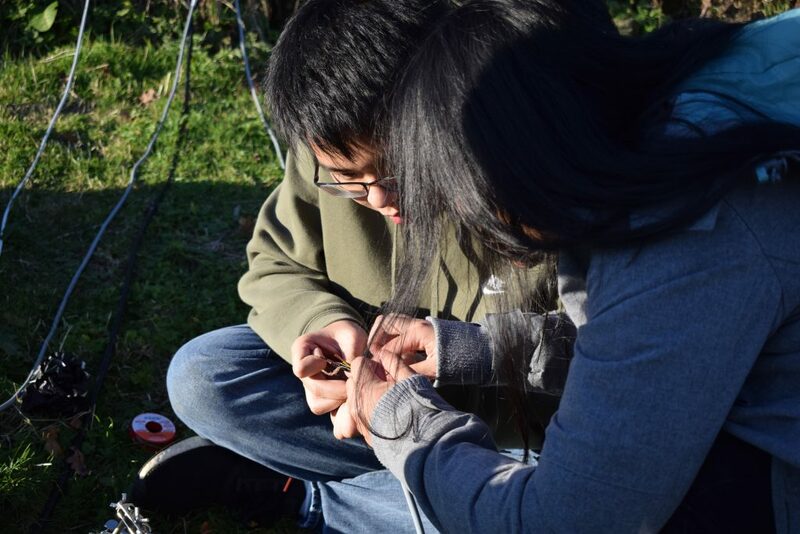 Alexis and Nathan working hard on replacing one of the four-core cables that run power and control signals between the control room and radio telescope. This job can be very fiddly, so good teamwork is required. The other pressing concern was to more sturdily affix the feedhorn mount to the dish. When it was fitted previously it was held in place by cable ties. This solution was a good stop gap, but it suffers two severe problems. Firstly, they are single use, which makes adjusting the feedhorn position during commisioning very wasteful. 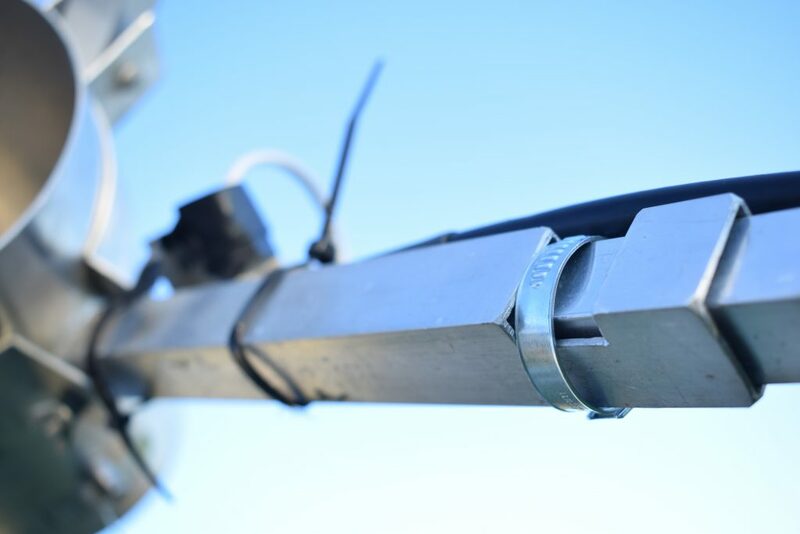 Additionally, plastic cable ties are great for attaching wires to the struts, but holding heavier objects in place, such as the feedhorn, is a whole other proposition. So, we improvised a more sturdy solution. This idea comes straight from Danial, who designed and built the feedhorn mount in this post. We used a worm drive hose clamp, also know commonly as a Jubilee clip, to apply pressure between the strut and the mount. When we perform comissioning, hopefully in early 2019, we should be able to position it more permanently with a screw and bracket, but this will prevent it from being carried off by the cold winter winds in the meantime. One of the Jubilee clips holding the stuts firmly in the feedhorn mount. When a final position has been decided, these will likely be replaced with a screw and bracket. The upshot of this day is that we have ordered a whole slew of new cables to replace the tarnished ones. This includes two new 4 core cables that carry power and pulse lines to the motor and the cable that goes between the feedhorn and low noise amplifier, which was mysteriously missing leaving only the connectors last time we visited. We are planning a final site visit of 2018 to complete this work and re-ready the telescope for the harsh winter months.